What does it mean to return to the question of authorship in a seemingly “post-everything” theoretical context? 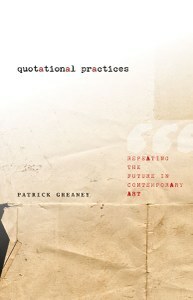 Patrick Greaney’s recent book Quotational Practices: Repeating the Future in Contemporary Art (2014) responds to this question by analyzing the historical and critical function of quotation in modern and contemporary art. Specifically, Greaney rejects the conventional defense of appropriation in art that simply reproduces the “death of the author” argument. In his opening pages, Greaney states that quotational works are “most often understood as questioning, challenging, dismantling authorship – and that’s it” (x). He goes on to suggest that critics and theorists of art ask the wrong questions by tying their analysis—whether negatively or positively—to “the modern notion of the author or artist whose works are original, referential, timely and immediately critical” (xi). Instead, highlighting the ways in which texts are displaced across multiple overlapping sources and cultural histories, Greaney charters a new path for understanding quotation as critical practice. To develop his argument, Greaney analyzes a number of modern and contemporary artists and writers who pursue non-unitary forms of subjectivity through experimental forms of writing. The book is organized around five case studies, beginning in 1950s with theorist Guy Debord, who advocated for a total upheaval of the dominant social order in post-war Europe, and ending with the contemporary artist Glen Ligon, who produces text based paintings that negotiate the complex histories of racial identity in the United States. In each of his analyses, Greaney draws heavily on linguist Émile Beneviste’s writings on language and subjectivity, principally his argument that “I” does not signify a specific speaker but refers only to the “instance of discourse” (120). He emphasizes Beneviste’s theory that when we encounter “two successive instances of discourse containing ‘I,’ uttered in the same voice,” nothing guarantees the separation of one “I” from the next (120). Greaney’s foundational argument, then, is that there is no necessary primacy of this “I” as compared to the next. Across and between his sometimes seemingly disparate examples, Greaney’s reading is not focused simply on the supposedly authentic disclosure or discovery of the self, but rather considers the ability for overlapping forms of authorship to animate transitory, unstable, and ongoing processes of subject formation. Greaney’s argument is also deeply rooted in Walter Benjamin’s reading of quotation as the repetition of the possibilities within source materials. Benjamin’s interest in the potential of quotation to cultivate the “untimeliness of the present” and reflect the “unrealized past.” In particular, Greaney draws on Benjamin’s concept of the “dialectical image” to demonstrate how quotational writing can be used to think beyond commodity language and against the logic of the redemptive progress of history. In Chapter 1, Greaney reads the dialectical image in relation to the philosophies of Nietzsche, Heidegger and Adorno. In the work of each theorist he traces a certain interest in the “emergence of the moment,” the possibility of returning events to the “there” of their surfacing, by means of repetition (532). Greaney concludes the chapter by offering crucial point that frames each of the case studies that follow: “Quotational writers manage and administer texts and documents with the aim of liberating themselves from the histories that find their origin there” (17). Chapter 2 focuses on the Situationist concept détournement, particularly taking up the book Memoires (1958) created Guy Debord and Asger Jorn. Détournement, here, refers to the critical repetition and reuse of an actively extracted element to create a new meaning that contains the liberatory potential of the future within the present. The concept of détournement is central to Greaney’s understanding of the historical function of quotation because it “appears as a multiplicity and tension in the present” (31), a tension that is evident (either positively or negatively) across a variety of late 20th century conceptual writing practices. Greaney focuses on positioning Debord’s philosophy against itself to deduce “what makes detournement possible.” Here, he takes issue with the gendered aspects of Situationist language by considering the ways in which Debord’s theory of a reproduced pseudo-cyclical time seems to depend on a feminized, passive spectacular subject that must be overcome by an active, masculine interruption of historical time. By tracing the example of Charles Baudelaire’s poem Solitude (1869), Greaney points to the inadequacy of the active/passive binary and instead opens up the definition of détournement to encompass interruptive forms of passive insinuation through quotation. Thus, reaching further into the foundations of the Situationist critique, Greaney arrives at the point that détournement can and should be continually détourned onto itself, “even if this is not Debord’s intention” (39). In Chapter 3, Greaney turns to Belgian artist Marcel Broodthaers to consider the relationship between quotation, irony, and bourgeois artistic production. Broodthaers maintains that art must attempt to contest reification, and, at the same time, that art is reification – a paradox that expresses the impossibility of remaining outside of the structure of the art market and achieving the status of a “political artist.” Thus, the artist explores different ways to construct a capitalist critique using the ironic double play between his own “guilt” and “innocence” as a producer of luxury goods. Within this framework, Greaney focuses on Broodthaers’ limited edition artist book Je hais le mouvement qui déplace les lignes (1973), which consists of a drawn-out, fragmented quotation of Baudelaire’s sonnet “La Beauté” (1857). Greaney argues that with Je hais, Broodthaers removes the trace of his voice from the text, and, sets Baudelaire into motion through the form of the artist book to critique art’s spectacularization (84). In this transformation of authorship, Broodthaers both defers the finality of Baudelaire’s poem and maintains a sense of critical distance in his own work. For Greaney, this demonstrates that it is the “I” in the title Je hais that has been opened up, abandoned, revisited, and détourned once again. The focus of Chapter 4 is Austrian writer Heimrad Bäcker’s transcripts (1986), a book comprised solely of first hand quotations taken from official documents relating to the Shoah. As a former member of the Nazi party, Bäcker touches on the difficult question of historical non-resolution by homogenizing these varying sources and speakers into one body of work. For Greaney, Bäcker is able to interrupt the utopian language used in Nazi propaganda, as well as post-war efforts to “bury” National Socialist language. Furthermore, by analyzing the aesthetic qualities of the Nazi documents alongside discourses in concrete poetry and other avant-garde conceptual writing practices from the time, Greaney suggests a utopic and revolutionary mode of thinking can be “imbricated in all aspects of modernity” (109). Through his authorial “incompleteness,” then, Greaney argues that Bäcker displaces the utopic modernist sensibility and stages the impossibility of ever comfortably knowing when or how the “I” can exist outside of the language in which its “own” histories are written. Ultimately, Greaney suggests that transcripts counters violent identitarian thinking by creating new fictions that are “uncomfortably close” to and yet “disturbingly distant” from their sources (91). Lastly, in Chapter 5, Greaney turns to three contemporary artists who employ quotational practices in their work, namely Sharon Hayes, Vanessa Place, and Glen Ligon. Across the three case studies, Greaney focuses on the ways in which quotation allows these artists to remain silent “in their refusal to speak for themselves or as themselves” (117). Overall, he argues that their works exercise the historical contingency of Beneviste’s “I” and achieve an opening up of history whereby alternative, liminal forms of subjectivity can be imagined. Greaney’s strongest argument emerges from a reading of Hayes’ performance titled In the Near Future (2009) in which the artist stands in a busy street holding up a sign that reads “I AM A MAN,” a direct reference to iconic images that emerged out of the 1968 strike by Black sanitation workers in Memphis, Tennessee. In the Near Future points to a double negative identification where Hayes “herself” neither belongs to the masculine “I” presented in the text, nor to the historical context from which this writing is sourced. For Greaney, the historical “untimeliness” of this gesture produces an “an out of sync present” that highlights the uncertainty of our personal and political futures (121). Overall, one might contend that Greaney’s separate case studies, which span from 1950 to 2008, could have featured a tighter selection of artists and/or socio-cultural themes. However, these general structural questions should not detract from the content of his critique. The text will prove to be a valuable teaching tool in advanced contemporary art and literary theory classrooms because it invites its reader to think beyond those established forms of interpretation that focus on authorship solely in terms of its preexistent “authenticity” or “originality.” Instead, Greaney reads quotation as an intentional form of historical displacement from the aesthetic, cultural, and political norms that lie at the heart of a persistent modernist utopian logic. Quotational Practices teaches that the transitory loss of the historical stability of the “I” is, in itself, an interruptive gesture in which the seemingly dead past becomes the stuff of future possibilities. Greaney, Patrick. Quotational Practices: Repeating the Future in Contemporary Art. Minneapolis: University of Minnesota Press, 2014. Print. Adam Barbu is an independent curator of contemporary art based in Toronto, Canada. He is currently pursuing his graduate studies at the University of Toronto. He produces art exhibitions that explore themes of cultural memory and the politics of spectatorship. His current critical research focuses on minimalist art, queer theory, and “post AIDS” discourses.